Gretsch - Andertons Music Co.
Gretsch guitars are one of those brands that just ooze class. Known mostly for their hollowbody guitars with a Bigsby trem system you’ve probably seen these guitars on stages around the world. Gretsch also produce drum kits with an uber-cool vintage vibe and are loved for their warm punchy tones. Their guitars are popular in Blues, Jazz and Rockabilly styles of music. 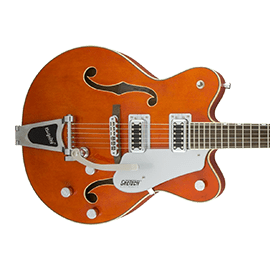 Gretsch guitars have got a characteristic crunchy mid-range to their tones thanks to their choice of pickup (the Filtertron) and the Bigsby trem means players often coax smooth, wavy clean and crunch tones from them. Gretsch have been around since 1883! They mostly produced banjos and drums and a few guitars until the golden era in 1955 when their Electromatic series took off and players like Chet Atkins became renowned for using a Gretsch guitar. They continued producing guitars throughout the 50s, 60s and 70s but unfortunately were on a steady decline. That is until they moved their production to Japan in 1989. This was a massive revival for the company and Japanese Gretsch guitars are some of the most sought-after vintage guitars in the world. After slowly building their line-up under the Historic, Electromatic and Sychromatic names (including a few ‘custom’ American-made models) Gretsch had their production taken over by none other than Fender in 2002. This was the start of the second golden era. Fender immediately went about fixing complaints that Gretsch fans had as well as introducing new models and improving the older lines. Under Fender’s stewardship Gretsch have bloomed once again and are one of the big guitar names in the world once again. At the top of the Gretsch tree you’ve got their Japanese-made guitars. These include famous shapes like the Chet Atkins and White Falcon models. Most of their guitars are hollowbody instruments but they have got famous solid body shapes like the Pro Jet and Penguin models. 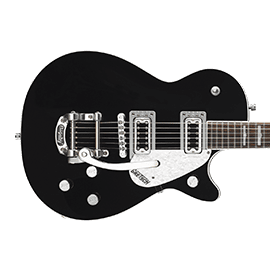 If you want more affordable Gretsch models you can look at the Streamliner range which are made in their new Indonesian factory and provide excellent value for money. These guitars have won all sorts of industry awards since their release in 2015. And for guitars that are in-between the Japanese and Indonesian models their Electromatic series are the answer. 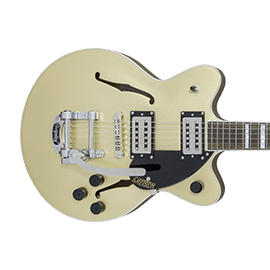 Most of the guitars mentioned above have that gorgeous, crispy-sounding Filtertron pickup to give you tones that are unique to Gretsch guitars alone. Facet Value 14" (10) 14"